owls about that then! : 1st & 2nd ?? As the title suggests, I managed something for the first time and second time on Thursday evening. The first was something I have witnessed on many previous occasions and luckily have captured images of it occurring, but never on video! I was staked out at my Little Owl site No 127, the male owl was sitting out in a pollarded willow tree and posing nicely for me (image below). The late evening sun was definitely in my favour, what spoilt the images was the horrid "messy" background of the twigs and branches. Then the hen owl made an appearance, she was a little deeper and higher up in the willow than that of the male, but as this was the nearest I had ever been to her I had to get some images. I wasn't very hopeful that I would get any "keepers" of her as she was in deep shadow, but how wrong I was! I am actually very pleased with this image (below) I really like how the slither of sun penetrates through the branches to highlight just her face, a bit mystique I think?. 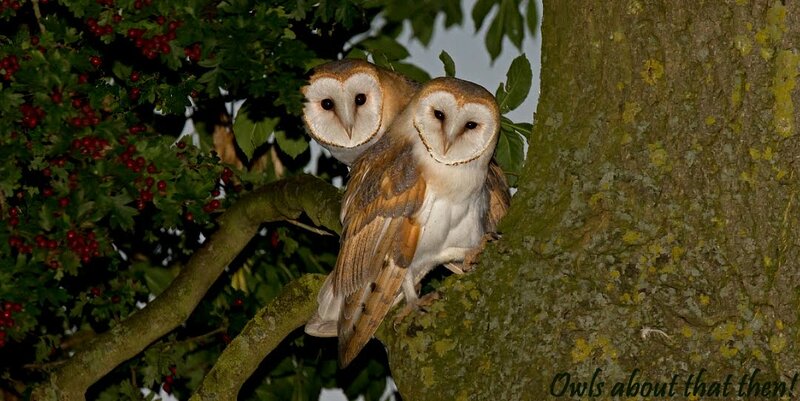 The hen owl then dropped down onto the same branch as the male allowing me to get picture of them both together. I was so busy messing about with my camera settings I nearly missed what happened next, the male starting to get very vocal and the hen replied with some calls of her own, they were getting agitated and excitable! I'd seen this behaviour before............! I quickly changed my settings and for the first time ever caught Little Owls mating on film. This clip (below) is just a short extraction of a very extended session!! I stayed with the owls until it was dark, that is when I managed this image (below) with the aid of the flash. This is definitely my favourite image from the night, an uncluttered and diffused background.....just how I like it! Well you have read down to this far and I haven't yet mentioned the "second" thing I witnessed, but I have published an image of it, did you see it? If you go back up to the "mystique" image of the hen owl (second from the top) you will see she has a ring on her right leg! Now there is no one else for miles and miles who rings Little Owls so she has to be one of mine!!!! Only the second owl that I have encountered with a ring on. 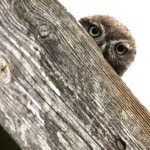 I first located this site (No 127) on the 23rd September 2010, so it is impossible she is a juvenile that was rung from 2011, therefore she is a 2010 baby, the first year I started to ring owls. From that year we ringed owls at five different sites, the nearest being 3.0km away and the furthest 6.75km away! One would assume she is from the nearest ringing site from that year, but who can tell? I will now try to study this site on a more frequent basis with the aim of reading the numbers on her ring, not sure how the hell I will manage it but until I do her natal site will remain a mystery! You spend so much time with these beauties, why don't you colour ring them and do an RAS study? That can't be right Paul - I've seen a bloody Canada with a colour ring! I had a discussion with the BTO about a coloured ringing scheme with my owls. It would then allow for easier ID in the field and a lot could be learnt about movement, dispersal etc. They weren't over enthusiastic about it, the Little Owl is not concidered to be of "conservation concern" and apparently the ring (coloured or not)can not be seen easy enough in the field due to the fur on the leg! Paul, that is tremendous footage, absolutely magical to watch. Superb images and the shadowy one is brilliant. Congratulations on the ringing. This is a truly great website mate. Hi Christian, glad you liked the "mating" footage, it was magical to witness never mind to share.... I'm also glad you liked the "shadowy" image, I thought it was a bit different? Hi Mike, thanks for your comment, glad you liked the footage. Great story Paul, and some super images (as always! ), but for me that last image is one of your best. Cheers Richard, it was a long time in the making (capturing), I am very happy you agree the last image is a bit special, I think so too!